ABOVE: The hangar doors at Flying Aces are about to open to take guests back in time on the biplane ride of a lifetime at Ferrari World Abu Dhabi. All Photos courtesy of George Walker. It was less than five hours before my flight to New York for the Christmas holidays with the family. I had been working with the scenic crew, who were carving the cement in the scene where the truck is stuck in the mud. The truck is meant to appear tilted and sinking with three wheels set into the soft ground, and the fourth wheel up in the air. Somehow, something got lost in translation. A mound of cement had been mistakenly built up under the fourth wheel, causing the entire point of this scenic detail to be lost because now the wheel wasn’t free to spin in the air. While I was talking the problem over with the crew, the cement was hardening. I picked up a jackhammer myself and began chipping away. Within moments, the crew quickly joined in. Two hours later, we had fixed the scene, and not long after that, my aching body was sound asleep on a plane headed for America. Building great theme park attractions is the greatest thrill in my life, but it is also a tremendous effort that requires passion, drive, and sacrifice, along with a great, visionary client. I sincerely believe that this comes through in the work that we do in the theme design industry. These unrelenting efforts lead to elements that seep into people in a magical way as they experience the worlds we create, which is why theme design is such a special and tricky thing. A look at the team that brought Flying Aces to reality at Ferrari World Abu Dhabi would not reveal a polished and seasoned crew of veteran theme park builders. Rather, it was an eclectic mix of colorful folks from all corners of the world, each bringing their special skills, talents, and of course, challenges. There were not only linguistic gaps to overcome, but cultural and experiential ones as well. What made sense to one person might seem ridiculous to another. So how do you forge a single vision out of so many different perspectives? Simply put, never give up. Leave no one behind and always push everyone as hard as it takes to get them on board. If you don’t give up on them, they won’t give up on you. And in the end, the vision will prevail. Flying Aces is a tribute to that principle. The build up to the load station is designed to make guests feel as if they have stepped into the movie screen of a romanticized version of history. The deadline was looming and we were behind schedule. The project site was a labyrinth of scaffolding crawling with workers like ants at a picnic. I had been fighting for weeks to keep the various trades from mounting electric outlets, security cameras or light fixtures onto the 30-meter-plus long wall at the far end of the show building. I felt like the Greek mythological character Sisyphus, doomed to roll the boulder up the hill over and over for all time. No one seemed to grasp that this wall must be kept free of obstruction because it was, in fact, a projection surface. We had the talented crew from Holovis on site, swooping in with precision and purpose, wielding their speakers and projectors. Amidst this controlled chaos, they somehow managed to install their gear. That was when something magical happened. This room was filled with more than 100 crew members all working furiously. All suddenly stopped and silently stared in amazement. The projectors had been fired up for the first time, and the room came alive with the images of planes flying in a brilliant sunset sky! From that moment on, language barriers melted away, cultural confusion evaporated, and everyone understood that what we were building here was special. It’s the eve of the grand opening. Armed with a cappuccino and a few more hours of sleep than usual, I’m feeling confident that the past three years’ work has been worth it all. Or am I? Sometimes the view of the forest is blocked by the trees… and we weren’t quite out of the woods yet. I think back to the earliest days of the design, when we were scratching out all these ideas on a sketchpad. And now here they were, erected for real, ready to welcome guests. I tuck myself into a dark corner of the queue to watch the first guests wander in. Their pace slows down as they enter the first queue show scene and I can see their eyes light up and camera phones come out. Scene after scene, their smiles get bigger and bigger. My racing pulse starts to slow as relief starts to set in. They make it into the scenic climax – the big room with the projected planes in the sunset sky – and they stop in their tracks and stare. The thunderous sound of planes flying overhead shakes the room, as they duck from their imaginations. Laughter comes next when they see the parachutist tangled in the tree. 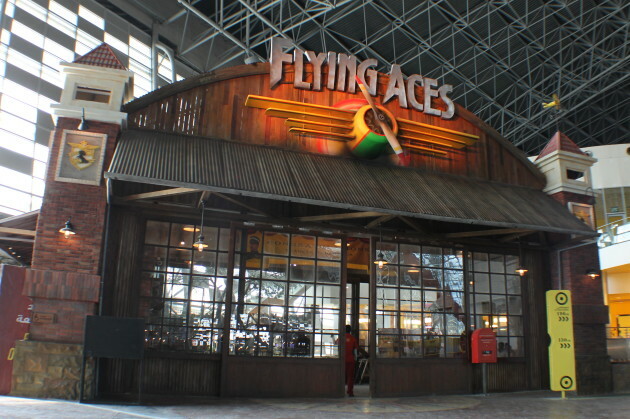 Flying Aces is an experience about World War I airplanes – but in a theme park about cars? How does that even make sense? The answer is drawn from the origins of the image of the Prancing Pony in the center of the famous Ferrari logo. It turns out that there is a wonderful story behind the logo that takes us back in time to the bygone era of the golden age of flying. The objective of this attraction was so much more than just to find an excuse to build another roller coaster. Someone is always building another thrilling roller coaster, so we wanted to make this one truly special and unique to Ferrari. This goes way beyond your basic amusement park-style coaster. This is a true theme park, top-of-the-line attraction of “E-Ticket” stature, and a true engineering marvel brought to life by the perseverance of the resident geniuses at Intamin. The era of WWI biplanes has a romantic quality to it and we wanted to deliver that to guests as part of the overall story. The goal was to instill a sense of cinematic wonder within the guests that would make them feel as if they stepped into the movie screen of a classic film. One such image that this era conjures in the mind is that of planes dramatically flying off into the sunset saturated with reds and yellows. We knew this had to be a key moment in our experiential story. We also wanted to take guests back in time, which requires meticulous set dressing and attention to detail. People take cues from their environment instinctively to assess what’s going on around them. You have to feed that perception so that they go with you on this journey. An old-fashioned ticking of a windup clock next to the bed; the tinny sound of period radio on the desk; an old truck stuck in the mud of an unpaved road – the kind you don’t see anymore. The cumulative effect of these cues tells the guests when and where they are. Propellers, plane parts, crates and gear from the past help create the illusion of another time. A good attraction should also make you feel like you are part of a story. Flying Aces isn’t really about the historical figure or anecdotal tie-in to the logo, it’s really about you! You, the guest. You are the one stepping back in time to become a pilot. You get to see and feel what it was like to live back then, sense the dangers from flying these fragile contraptions and revel in the bravery it took to take to the skies like these pilots of old. That’s a fun pitch to deliver in a boardroom with some slick bullet points and a collection of image references on a screen. The real trick is, how do you deliver upon that expectation? Enter the theme guys. We used as many techniques and tricks as we could, and as always, under a budget that was tighter and a schedule that was shorter than we wanted. We had a team of mixed talents and checker-boarded experience which all had to be carefully balanced – a project management feat that Tom Black, the Farah Leisure PM, impressively accomplished. Taken as a whole, we had our bases covered, but role-by-role, it was definitely a diverse and unique group. Concrete is carved to become a “character” that environmentally helps tell the story of Flying Aces. I would often start kickoff meetings by asking who in the room had been to a theme park before. Many times, no hands went up. This definitely added to the challenges, but also added to the fun, which came from watching the evolution of everyone’s understanding of what true theme design was. One of my favorite conversations involved a talented architect on the project named Baha. Having only worked in the Middle East, he had never been to a theme park. We were discussing the use of carved plaster to create brick finishes in the façade work, and he asked why we didn’t just “use real brick?” On the surface, this seems a logical question. “Control,” I replied. He looked confused. “Think of the brick as a character in our story. I need it to act the way I want it to.” He looked at me like I was nuts. Several months later, after the skilled carvers had applied their craft and sculpted gorgeously aged bricks, deeply grooved by weather and filled with the charm that takes nature centuries toapply, I took him on a site walk to show him the final product. His expression echoed the words he uttered, “Ahhh. I get it. Character.” He was converted. Theme design. The immersive queue of Flying Aces is designed to build anticipation for the coaster experience that lies ahead. How to transport people back in time? Fortunately, the “flux capacitor” isn’t the only thing that can transport people back in time. But the process is slightly subtler than flaming trails of skid marks. In the case of Flying Aces, we knew we had to make the transition as delicate as possible because Ferrari World Abu Dhabi is one of the most modern and beautiful architectural structures in the world. And so our plan really had to start at the entrance to the park. As you walk past the turnstiles, guests are met with this spectacularly impressive space frame marvel. It culminates into a glass vortex shape at the center that looks like it has come from the set of a science fiction film. We didn’t want to simply slap people in the face with an early 1900s environment from here. Figuratively speaking, we had to take them out of Ferrari World itself – and so our first transitional step takes them to Italy. With a few strategically placed trees as a buffer, the splashing sounds of an Italian fountain draw you toward an all-new elaborate façade that we created that replicates an Italian street. We haven’t traveled in time just yet. The street is set in modern times, but it is an old street filled with details, props, and animated window displays. This is the first step. The layers of façades continue for well over 100 meters, giving you a chance to immerse yourself in the Italian lifestyle. It is only at the end of the street that the time period starts to shift and you see the full scale WWI biplane that is the basis of the story of Flying Aces. This frames your view of the adjacent hangar building that is clearly out of the past, but its colors and accents seem to blend seamlessly with the rest of the Italian façades that culminate at the hangar entrance. The spinning propeller on the marquee sign grabs your attention as your ears are filled with the sweeping, majestic orchestral score of the attraction, the Italian music classics from the street fading out behind you. Once through the hangar doors, you see the barracks of the 91st Squadron just ahead. Our time travel has begun. The setting starts to change, and the music plays a magical part in our time travel trickery. Holovis media producer Amy Steele cleverly layered the audio so that the same score from the entrance is replayed from a tinny, muffled point source coming out of an old-time-radio inside the barracks. Combine this with the introduction of countless props and set dressing cues that put you a century in the past, and it’s as if you have stepped through the wardrobe into Narnia. The sights, the sounds, and the feel of the space are as opposite as possible from the contemporary Ferrari World you were in just moments ago. How do you turn theme park guests into WWI pilots? The environment of a training camp is intentional because we are also “training” the guests. They were just in a theme park about cars, and we needed to get them thinking about planes. Not just thinking about them, but really excited about them! To do this, we exaggerated the richness of the experience so that you felt like you were not only stepping back in time, but stepping into one of those movies that romanticizes the retelling of history just a bit. When you step out of the cluttered supply tent, for example, you are presented with a stunning sky mural filled with projection-mapped planes soaring and looping. A speaker array in the ceiling completes the illusion of planes flying overhead with a thunderous roar, and the distant buzzing of the others on the horizon gives the scene depth. The entire time you are in this space you are literally surrounded with planes. We even put a set piece that recreates a plane being constructed so that guests could see the wooden frame and stretched canvas that they were made of. By the time you reach the load station, we’ve bathed you with imagery of takeoffs, barrel rolls, and banked turns. You feel like you are part of this world; a pilot ready to fly. How do you make a space feel like it is full of people, when in reality, it is totally empty (except for your fellow guests of course)? This isn’t a new challenge. Theme parks have been populating their worlds with people for decades, and we were no different. But it is fun to bring this illusion to a new corner of the world. If we are to have guests believe they are in the training base camp for the Italian pilots of the day, we didn’t want it to feel like an abandoned one. And it definitely doesn’t. There are “people” everywhere. A peek through the many muddied windows of the barracks and supply tent shows soldiers marching by and planes taking off. From behind a fence or cluster of bushes you can hear other pilots having a conversation, for example. In the supply tent, we wanted it to feel like the ending scene from Indiana Jones; a place so filled with crates and stuff, that you can only see limited, cluttered sections of the room at a time. Then we placed audio of other people talking within the room, but it’s so full of things, you can’t tell where the conversation is coming from. Later, we introduce you to a plane that has soft-crash-landed into a tree unharmed. Via a projection-mapped face, the pilot chatters away, livening up the space. Further on, you pass by a foxhole populated with two pilots playing cards, thanks to a classic Pepper’s Ghost illusion. Even in the radio room, a half eaten sandwich and spilled drink let you know that someone was surely here only moments ago. How do you preserve the illusion of this environment inside one of the most modern buildings in the world? From the outside, the building you are in is a modern, red and steel checkered structure. Obviously if guests were aware of this, it would destroy the illusion. The load station was especially challenging because it is meant to look like an old, rickety wooden-slat barn. This is perhaps my favorite, subtle design illusion that we created. To give the feeling that sunlight was seeping though the cracks between the planks of wood, we actually created a backlit, double wall. This was so effective that, even when I revealed the illusion to one of the guests during soft opening, they didn’t believe me. They were convinced it was real sunlight pouring in. Elements like this took the collaboration of the clever team of lighting designers at Pioneer working handin-hand with the scenic craftsmen of Aspen Creations, and the result was truly rewarding. How do you make a steel rollercoaster feel like a tiny wooden plane? You really can’t make a hunk of steel roller-coaster train look like a biplane. To help with the suspension of disbelief, however, we don’t reveal the coaster to guests at all until the very end. At that point, they are so focused on flying, that our vehicle design needed only to merely hint at airplane elements without trying to be too literal. The propeller and rounded nose on the front, we felt, would be enough to communicate the intent. From there, it is more about the sensation of flight that the engineers at Intamin craftily created that completes the illusion. How do you conclude an experience like this one and bring guests back to the present? As the guests exit the attraction, the denouement is one that reinforces the sense of pride and accomplishment. You have just “earned your wings” so to speak, and we want you to feel like you now belong among the other revered heroes who, like you, have braved the skies. And so as you exit, the setting has a lofty quality to it. The corridor is museum-like with photos of the first pilots proudly hanging on the walls, and you feel like your photo could easily be among them. Model planes hang from the ceiling, and even the chair rail is carved to look like a plane wing. The time transition is completed with a reverse cross-fade from before: This time, the tinny score slowly transitions back to the full, orchestral version by the time you’ve reached the end of the hall – and conveniently, at the retail counter where you can find trinkets to commemorate your experience. You have now stepped off the movie screen and are once again back in the modern world of Ferrari. George Walker, now VP Creative Development, Dynamic Attractions, and concurrently the Creative Director of Ferrari World Abu Dhabi.